"Satrapi" redirects here. For the jurisdiction of an ancient Persian governor, see Satrap. 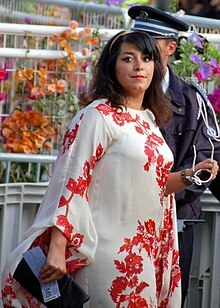 Satrapi was born in Rasht, Iran. She grew up in Tehran in a middle-class Iranian family. Both her parents were politically active and supported Marxist causes against the monarchy of the last Shah. When the Iranian Revolution took place in 1979, they were dismayed and intimidated by the Muslim fundamentalists who took power. Her parents grew concerned that Marjane, a strong-willed and rambunctious teenager, would run afoul of the strict new public codes for women. They arranged for her to study abroad, and in 1983 she arrived in Vienna, Austria, to attend the Lycée Français de Vienne. According to her autobiographical graphic novel Persepolis, she stayed in Vienna through her high school years, sometimes staying at friends' homes but also living on the streets for three months. After an almost deadly bout of pneumonia, she returned to Iran. She studied visual communication, eventually obtaining a master's degree from Islamic Azad University in Tehran. During this time, Satrapi went to illegal parties hosted by her friends, where she met a man named Reza, a veteran of the Iran–Iraq War. She married him at the age of 21, but they divorced a couple of years later. Satrapi then moved to Strasbourg, France. Satrapi is married to Mattias Ripa, a Swedish national. They live in Paris. Apart from her native language, Persian, she speaks French, English, Swedish, German, and Italian. Satrapi became famous worldwide because of her critically acclaimed autobiographical graphic novels, originally published in French in four parts in 2000–2003 and in English translation in two parts in 2003 and 2004, respectively, as Persepolis and Persepolis 2, which describe her childhood in Iran and her adolescence in Europe. Persepolis won the Angoulême Coup de Coeur Award at the Angoulême International Comics Festival. In 2013, Chicago schools were ordered by the district to remove Persepolis from classrooms because of the work's graphic language and violence. This incited protests and controversy. Her later publication, Embroideries (Broderies), was also nominated for the Angoulême Album of the Year award in 2003, an award that her novel Chicken with Plums (Poulet aux prunes) won. She has also contributed to the Op-Ed section of The New York Times. Comics Alliance listed Satrapi as one of 12 women cartoonists deserving of lifetime achievement recognition. Satrapi prefers the term "comic books" to "graphic novels." "People are so afraid to say the word 'comic'," she told the Guardian newspaper in 2011. "It makes you think of a grown man with pimples, a ponytail and a big belly. Change it to 'graphic novel' and that disappears. No: it's all comics." Persepolis was adapted into an animated film of the same name. It debuted at the 2007 Cannes Film Festival in May 2007 and shared a Special Jury Prize with Carlos Reygadas's Silent Light (Luz silenciosa). Co-written and co-directed by Satrapi and director Vincent Paronnaud, the French-language picture stars the voices of Chiara Mastroianni, Catherine Deneuve, Danielle Darrieux, and Simon Abkarian. The English version, starring the voices of Gena Rowlands, Sean Penn, and Iggy Pop, was nominated for an Academy Award for Best Animated Feature in January 2008. Satrapi was the first woman to be nominated for the award. However, the Iranian government denounced the film and got it dropped from the Bangkok International Film Festival. Otherwise, Persepolis was a very successful film both commercially (with over a million admissions in France alone) as well as critically, winning Best First Film at the César Awards 2008. The film reflects many tendencies of first-time filmmaking in France (which makes up around 40% of all French cinema each year), notably in its focus on very intimate rites of passage, and quite ambivalently recounted coming-of-age moments. Satrapi and Paronnaud continued their successful collaboration with a second film, a live-action adaptation of Chicken with Plums, released in late 2011. In 2012, Satrapi directed and acted in the comedy crime film Gang of the Jotas, from her own screenplay. In 2014 Satrapi directed the comedy-horror film The Voices, from a screenplay by Michael R. Perry. In 2019, Satrapi is directing a biopic of two-time Nobel Prize winner Marie Curie titled, Radioactive. Following the Iranian elections in June 2009, Satrapi and Iranian filmmaker Mohsen Makhmalbaf appeared before Green Party members in the European Parliament to present a document allegedly received from a member of the Iranian electoral commission claiming that the reform candidate, Mir Hossein Mousavi, had actually won the election, and that the conservative incumbent Mahmoud Ahmedinejad had received only 12% of the vote. 2008: Cinema for Peace Award for "Most Valuable Movie of the Year"
Persepolis: The Story of a Childhood. 1. New York: Pantheon Books. 2003. ISBN 978-0-375-42230-0. Persepolis: The Story of a Return. 2. New York: Pantheon Books. 2004. ISBN 978-0-375-42288-1. The Complete Persepolis. New York: Pantheon Books. 2007. ISBN 978-0-375-71483-2. ^ Hattenstone, Simon (29 March 2008). "Simon Hattenstone interviews Marjane Satrapi, whose best-selling comic book Persepolis is now an award-winning film!". Theguardian.com. Retrieved 8 December 2018. ^ a b "J'ai été très bien accueillie et je n'oublierai jamais que j'ai été naturalisée grâce à Jack Lang." (Abusdecine perse les secrets de « Persepolis » ). ^ a b "Vingt-deux films pour une palme d'Or". Lesechos.fr. Retrieved 8 December 2018. ^ "Marjane Satrapi". The Washington Post. 20 January 2008. ISSN 0190-8286. Retrieved 10 February 2016. ^ a b c d Hattenstone, Simon (29 March 2008). "Confessions of Miss Mischief". The Guardian. Retrieved 7 November 2012. ^ Bédarida, Catherine. "Marjane Satrapi dessine la vie de l'Iran." Le Monde. 25 June 2003. Retrieved on 21 September 2009. ^ Heather Lee Schroeder (2010). A Reader's Guide to Marjane Satrapi's Persepolis. Enslow Publishers, Inc. p. 136. ISBN 978-0-7660-3166-1. Retrieved 6 September 2011. ^ "Author Bio: Marjane Satrapi". Michael Schwartz Library: Cleveland State University. 2011. Retrieved 6 September 2011. ^ Flood, Alison (2013-03-19). "Persepolis battle in Chicago schools provokes outcry". The Guardian. ISSN 0261-3077. Retrieved 2019-03-13. ^ "Les nominés d'Angoulême 2003" (in French). ActuaBD. 10 December 2003. ^ a b BDParadisio. "32ème Festival International D'Angouleme" (in French). ^ Satrapi, Marjane. "Op-Ed contributors search". The New York Times. Retrieved 6 September 2011. ^ "12 Women in Comics Who Deserve Lifetime Achievement Recognition". Comics Alliance. Archived from the original on 1 August 2016. Retrieved 10 February 2016. ^ Gilbey, Ryan (20 March 2015). "Marjane Satrapi: the Persepolis director escapes her comfort zone". The Guardian. ISSN 0261-3077. Retrieved 10 February 2016. ^ Satrapi, Marjane (16 June 2011). "How to film a graphic novel". The Guardian. ISSN 0261-3077. Retrieved 10 February 2016. ^ a b "Festival de Cannes: Persepolis". festival-cannes.com. Retrieved 20 December 2009. ^ a b "Persepolis (2007) NYT Critics' Pick". The New York Times. 2008. Retrieved 6 September 2011. ^ "Highly Acclaimed 'Persepolis' Denounced by Iran". NPR.org. Retrieved 2019-03-13. ^ "Poulet aux prunes". AlloCiné (in French). Tiger Global. Retrieved 6 September 2011. ^ Young, Deborah (3 September 2011). "Chicken with Plums: Venice Film Review". Hollywood Reporter. Retrieved 6 September 2011. ^ "Q&A: "THE VOICES" Director Marjane Satrapi on Talking Animals and a Sympathetic Psychopath". Fangoria.com. Retrieved 8 December 2018. ^ "New Stills Hear The Voices - Dread Central". Dread Central. Retrieved 10 February 2016. ^ Keslassy, Elsa; Keslassy, Elsa (2018-02-19). "Amazon Boards Marjane Satrapi's Marie Curie Biopic 'Radioactive' (EXCLUSIVE)". Variety. Retrieved 2019-03-13. ^ Kellogg, Carolyn (16 June 2009). "Iranian author Marjane Satrapi speaks out about election". The Los Angeles Times. Tribune Company. Retrieved 6 September 2011. ^ Comic Book Awards Almanac. "Awards of the 2001 Angoulême International Comics Festival". Archived from the original on 5 May 2006. ^ "Angoulême 2002: les lauréats" (in French). ActuaBD. 25 January 2002. ^ "Film Selection: Iran — Cinema for Peace Foundation". www.cinemaforpeace-foundation.com. Retrieved 2017-10-20. ^ "KUL en UCL reiken samen eredoctoraten uit" [KUL and UCL award honorary doctorates together] (in Dutch). De Morgan. 2008. Retrieved 6 September 2011. Chute, Hillary L. (2010). Graphic Women: Life Narrative and Contemporary Comics. New York: Columbia University Press. ISBN 978-0-231-15062-0. Retrieved 6 September 2011. Tensuan, Theresa M. (Winter 2006). "'Comic Visions and Revisions in the work of Lynda Barry and Marjane Satrapi'". Modern Fiction Studies. 52 (4): 947–964. doi:10.1353/mfs.2007.0010. Wikimedia Commons has media related to Marjane Satrapi.